... instructions can be found here. We made these origami butterflies a few weeks ago as one of our theme activities. Seeing that the fox differed by only a few folds we attempted these too. Every one had a few finished ones and I am always happy to see that some students go off on a tangent once the know how to do this. 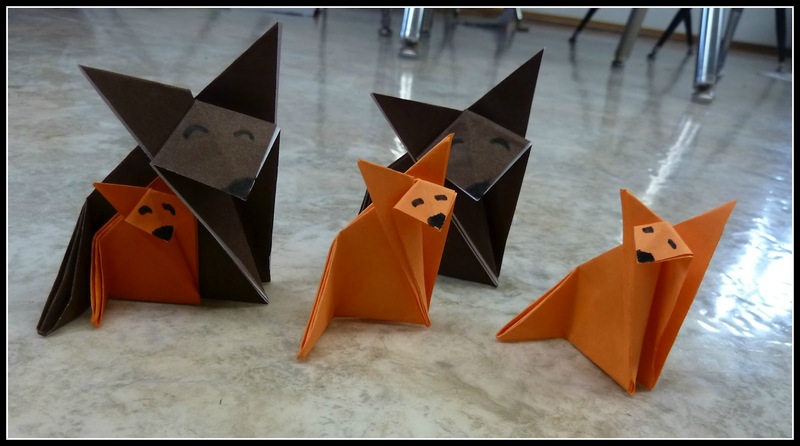 Origami Fox Family - created by one of my students in Grade 2. These are quite simple to make and after a few tries my students' fox collection grew to a family group! 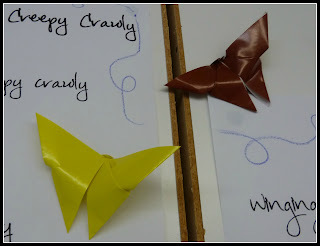 The brown paper is origami paper and the orange is simply sheets from a desk note block and plain paper cut down to size.